Many thanks to all the hostesses who kept us busy all weekend with such great challenges! Some are still open for prizes – others are just open til whenever. Go play all week long! And now…many thanks to our heroes. And cardmakers. Come back tomorrow for our OWH birthday post! [vlog] Hall-no-ween and hero mail…and money for your cruise! Win money for YOUR cruise vacation! Enter the Craft it Forward contest – this month they’re all about CARDS! Upload your card project here (click the “upload” button) – make sure your photo is well lit, crisp and clear – and be sure to include “OWH” in the title so we all know to vote for you! Poor photography and cryptic names won’t get you too far. During the week yours is posted (you’ll be notified by email), get your friends and family to vote vote vote daily. After there are winners from each of the weeks, the contest folks pick one of the weekly winners to receive $500.00! Doesn’t that sound like a deposit on your cruise berth?? Plus they give $500.00 to the charity of YOUR choice. How cool is that? St Kitts…one of our ports of call! Lovely! A great piece highlighting those who served – and those who serve our veterans! God bless them all. Be sure to post on your facebook, twitter, blog, etc, about our veterans this day. Honor their service, and invite others to do the same! Okay, friends, here’s the requested information about the coming video! First, the idea came from ABC’s “Your three words” project – you can view a bunch of what people have done by clicking here. There are some really touching ones! We’ll send our video to ABC after it’s finished and posted on Sept 12th – they just might be interested in OWH after they see our homage to their idea! Wouldn’t that be a great way to get their attention during our Birthday Bash? This will be an inspiring video….starring all of America! It’s an attempt to tell others the emotional story of what Operation Write Home means to everyone – is it an expression of your patriotism? A way to support your own hero? Linking arms with the rest of the nation to show your support for deployed warriors? Or maybe you’re a hero or family member who’s received cards, and want to tell everyone what you think. We’d love to cover all of this – in a series of images, each with just three words! We’ll set the photos to some beautiful and inspiring music as a soundtrack, and publish it on our birthday, 9/12! Pick your three words that say what’s in your heart; then, find a way to photograph them. Or shoot a superquick video! Note that there won’t be sound except the music – so if you send a video, have your words expressed visually. (You can submit them with audio, and we can strip that out in video editing.) Contributions due August 31! Word trio ideas: Here are a few idea starters…we’d love to have many different ones to tell the OWH story, so use these or come up with your own! Leave a comment on this post with what YOUR three words are….whether or not you’re able to submit a photo. Families who have received cards: Love Daddy’s card, Free mail rocks! OWH and Old Spice…a perfect combination! The email also contained info about next month’s partay!!!! Think of all those walk-a-thons and bike-a-thons you’ve been a part of. 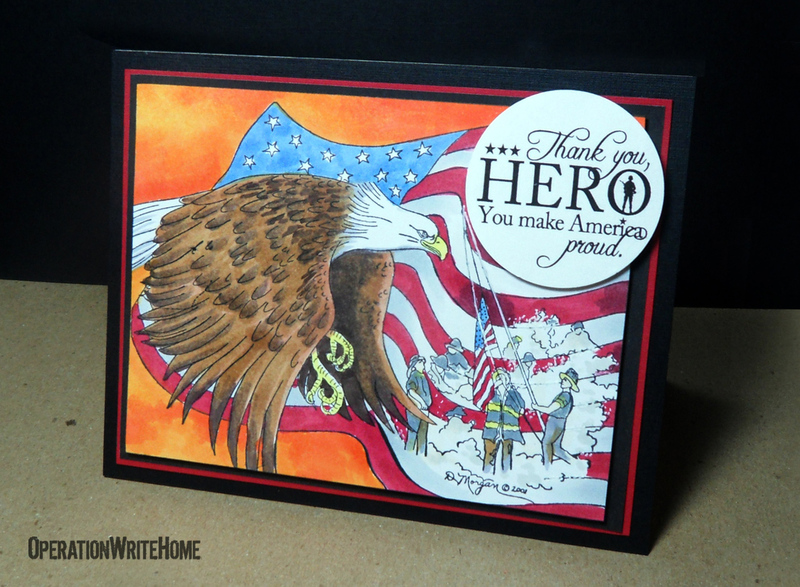 Your friends and family were happy to partner with you to raise money for causes before….why not cardmaking for our heroes? We have holiday shipping coming up and that gets crazy-expensive with all the shipping we’ll be doing. So we’d love your help in raising the dollars needed for spreading all the holiday cheer! You can do this easily online: Decide on a goal for yourself for the month of September….how many cards would you like to make for our heroes in a month’s time? Multiply that by an amount per card that you think your friends might give, then multiply that by the number of friends you want to get to donate! Or, you can pick a dollar amount. Boxes cost $12.50 to ship, and 8 boxes will travel for an even $100. Pick a goal, and then go for it! Then log onto firstgiving.com/operationwritehome, and set up a page! It’s really easy and only takes a few minutes to get going. It’ll let you email your friends, the site sets up auto-responses as they donate, and the funds get EFT’d over to OWH. Easy peasy, lemon squeezy! We’ll try to do some regular reporting about how people are doing – the number of fundraising pages set up, how the donations add up together. 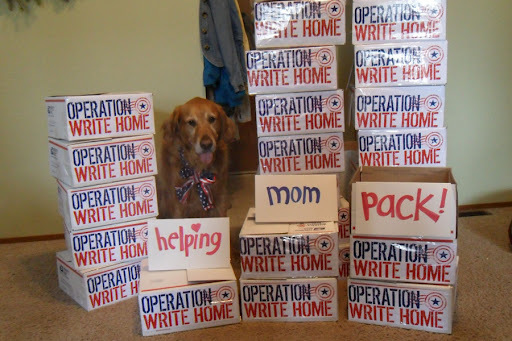 Help us add to the total so we can get plenty of boxes shipped this holiday season! This is being posted in The Mailroom as well – but since we know not everyone goes there often, we’re posting it here too. If you can only view videos on YouTube and not on our site or in blogger, go to the YouTube video itself. Any of your men want to try this one?